The Daily Sabah Centre for Policy Studies and the Daily Sabah's Arabic website organized a meeting Tuesday between a Turkish official, dozens of Arab and Turkish journalists and Arabic researchers studying Turkish affairs. The meeting was attended by Dr. Emrullah İşler, Ankara deputy from the ruling Justice and Development Party (AK Party) and former deputy prime minister of the 61st government, who is currently President Recep Tayyip Erdoğan's special representative to Libya, along with dozens of directors, representatives and correspondents of international television channels and media outlets from Turkey, as well as researchers on Turkish studies. The meeting was centered around the study of Arab-Turkish relations in regards to various political, economic and other issues, with a focus on Turkey's vision of fighting terrorism within the context of its recent military operations against the PKK and Daesh terrorist organizations in Syria and Iraq. "This meeting is an opportunity to strengthen cooperation between Turkish officials and journalists working on Turkish studies," Daily Sabah's Editor-in-Chief Serdar Karagöz said. "The Daily Sabah Centre will work in the coming period to strengthen and expand this cooperation in order to facilitate the work of Arab journalists inside Turkey." "Turkey attaches great importance to strengthening cooperation and rapprochement with all Arab countries and Arab citizens living in Turkey," he added. İşler noted the demands and proposals of Arab journalists and researchers to meet their needs in Turkey, in addition to proposals on the situation of Syrian refugees and Arab communities in Turkey. The meeting was part of the Daily Sabah Centre for Policy Studies' efforts to connect more closely with the Arab press working in Turkey and to facilitate communication between the Arab press and Turkish officials as a prelude for greater cooperation in the future in various fields. The Daily Sabah Centre for Policy Studies was established in 2015 in an attempt to explain and better address events and rapid developments in Turkey and the world. It organizes various events and activities, including round tables, workshops and conferences. 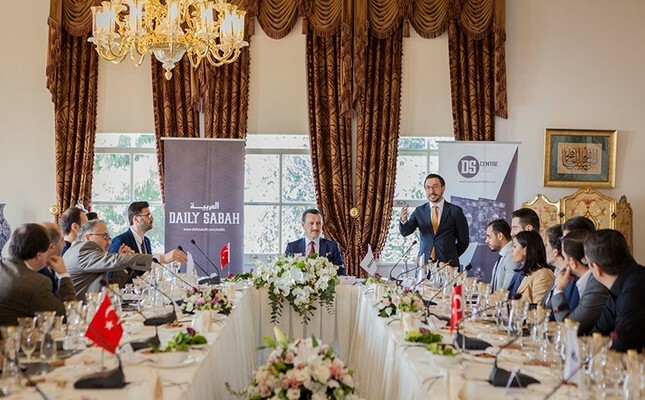 Daily Sabah is part of Turkey's Turkuvaz Media Group, which includes a large number of news and diverse television channels as well as newspapers, magazines, and various radio stations. It publishes a daily newspaper in English, in addition websites in English, Arabic, German and Russian.